We are living in an age where several deaths are occurred due to heart attacks. The statistics of the recent deaths reveal that it affected individuals across all ages. Keeping this in mind, Rajeev Rathi, a senior interventional cardiologist thought about developing apps for android and finally make the android app known as The Heart App for Smartphone users. In “The Heart App”, you will have to answer a couple of questions which a cardiologist would ask when you get a heart disease. Based on your answers, the app will give a result on whether you have a heart disease or whether you will have to consult a doctor for further medication. 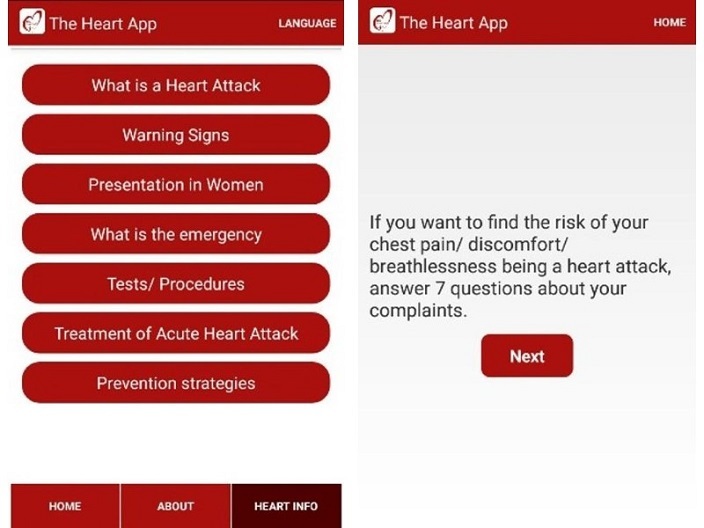 The app also provides a set of documents and materials on heart attacks and coronary heart disease. This app is never a replacement for a doctor. The main intention behind developing this newest android app is to spread a general awareness about the heart and the diseases associated with it. As the android app development happened under the guidance of a doctor, you can use this app without thinking twice. If you are confused about the condition of your heart before approaching a doctor, you can use this app to undergo a small checkup yourself. Let us know your views on “The Heart App” in your comments below. You might also like our APPS section that contains exclusive articles and reviews on the latest app releases. Trust me, you will be glad that you paid a visit there.